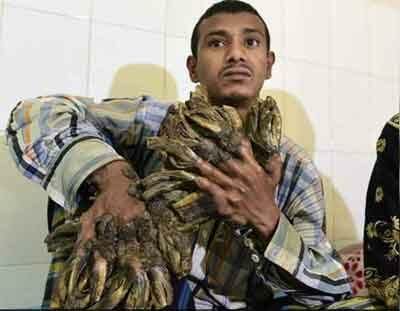 Dhaka: A Bangladeshi father dubbed the “tree man” because of the bark-like warts that once covered his body will soon be able to leave hospital after ground breaking treatment for one of the world’s rarest diseases. Abul Bajandar has undergone at least 16 operations to remove five kilos (11 pounds) of growths from his hands and feet since his condition came to doctors’ attention a year ago. The 27-year-old former rickshaw driver is one of only four people in the world ever to be diagnosed with epidermodysplasia verruciformis, an extremely rare genetic condition dubbed “tree-man disease” that left him unable to hold his three-year-old daughter. “We operated on him at least 16 times to remove the warts. The hands and feet are now almost fine. He will be discharged within next 30 days after a couple of minor surgeries to perfect the shape of his hands,” Sen said. Only last year an Indonesian man died of the rare genetic condition. Speaking from his bed at the Dhaka Medical College Hospital, which has been treating him free of charge, Bajandar said the pain of his condition had been “unbearable”. “I never thought I would ever be able to hold my kid with my hands,” he said, showing a bandaged hand. Bajandar, who comes from a poor village in the southern coastal district of Khulna, became a celebrity after his condition was widely covered in local and international media. He met his wife Halima Khatun before he contracted the disease, but it had taken hold by the time they married, against her parents’ wishes.